Raj has over 25 years of experience in the Healthcare industry and working with private equity. His Healthcare experience spans both working as a practitioner, having initially qualified and practiced as a cardiac surgeon at Oxford, through to extensive transactional experience gained most recently as Co-Head of Goldman Sachs Healthcare investment banking practice. Since 2001 Raj has advised private equity and corporate clients on over 150 transactions including several landmark European private equity Healthcare deals (including Nycomed, Gambro, Sebia and Phadia). 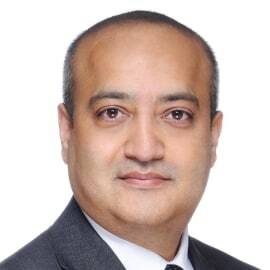 Raj Co-Heads the NC Advisory Healthcare sector team, and since joining has led the exit process for ConvaTec and is responsible advisor for Nordic Capital’s acquisition of ERT. He also holds several non-executive positions including the board of ConvaTec, ERT and Royal Brompton and Harefield Hospitals Charity and holds a BSc and degrees in medicine and surgery, MBBS from Imperial College London as well as being Fellow of the Royal College of Surgeons and an MBA from London Business School.